How to Hepburn, Karen Karbo’s sleek, contemporary reassessment of one of America’s greatest icons, takes us on a spin through the great Kate’s long, eventful life, with an aim toward seeing what we can glean from the First Lady of Cinema. One part How Proust Can Change Your Life and one part Why Sinatra Matters, How to Hepburn teases some unexpected lessons from the life of a woman whose freewheeling, pants-wearing determination redefined the image of the independent woman while eventually endearing her to the world. This witty, provocative gem is full of no-nonsense Hepburn-style commentary on subjects such as: making denial work for you; the importance of being brash, facing fear, and always having an aviator in your life; learning why and how to lie; the benefits of discretion; making the most of a dysfunctional relationship; and the power of forgiving your parents. Thrilling fans of the notoriously independent actress, award-winner Karen Karbo presents a gusty guidebook to harnessing your inner Hepburn, and living life on your own terms. “Katharine Hepburn died in 2003, four years shy of what would have been her 100th birthday. But if she missed the milestone, the rest of us can now celebrate her centenary, with the cleverly enlightening “How to Hepburn: Lessons on Living from Kate the Great.” Author-essayist Karen Karbo, who has written novels for both adults and middle-schoolers (kids might know her Minerva Clark mysteries), and nonfiction titles including the stirring The Stuff of Life: A Daughter’s Memoir, infuses biographical and historical data, film trivia and contemporary acumen into a lively homage that underscores why Hepburn’s name should be a verb”. 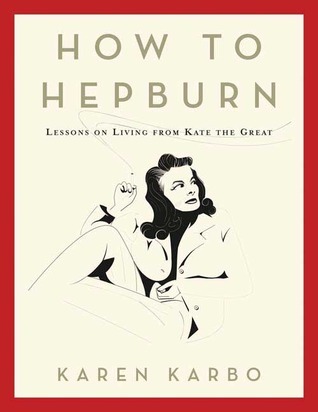 “Women wanting the most out of life need only look to Katherine Hepburn for guidance, says Karen Karbo, author of “How to Hepburn: Lessons on Living From Kate the Great,” out in May from Bloomsbury. “[She] handily redefined femininity, forced the world to ponder the meaning of marriage and gave generations of women fresh options for surviving middle age and beyond,” Karbo says. “An exuberant celebration of a great original”. “Karbo admits that, “you don’t always have to know what you’re getting into in order to succeed,” yet through these little witty comments, as told through the eyes of “Kate the Great”, Hepburn shows us how she made it work”. …a delightful, insightful little guide. . .
…smart, witty and profound in a low-key way – everything you’d expect in a book by Karbo.